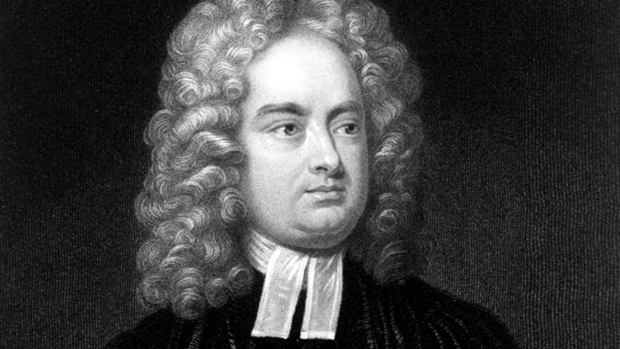 The author of the classic Gulliver’s Travels (1726), Jonathan Swift was a major figure of English literature. Also a satirist, cleric and political pamphleteer, Swift was born in Dublin, Ireland on November 30, 1667, seven months after the death of his father. Deprived of a bread earner and father, the family became very poor and had to rely on the aid of relatives to survive. Jonathan did not lead a healthy childhood, suffering from Meniere’s disease which causes dizziness, vertigo, nausea, and hearing loss affecting the inner ear. Early in age, Jonathan was sent to live with his uncle, Godwin Swift who supported him and gave him the best education possible. After returning from Ireland where he served as an Anglican priest for a year, Swift was requested by Temple to assist him in writing his memoirs, managing and publishing his work after his death. Swift started work on his own writing during this time as well and wrote The Battle of the Books (1704). In 1700, Swift was appointed Chaplin to Lord Berkeley and in 1701 Trinity College Dublin made him a Doctor of Divinity. In 1704, Swift published his humorous take on religion, A Tale of the Tub. Swift became an active figure of the Dublin society and politics becoming a blunt critic in efforts of improving Ireland. After joining the Tories in 1710, Swift wrote many noted political pamphlets including The Conduct of the Allies (1711), The Public Spirit of the Whigs (1714), Meditation on a Broomstick (1703) and A Modest Proposal. In 1713, Swift formed the literary club, Scriblerus along with Alexander Pope and others. He also became the dean of St. Patrick’s in Dublin. Swift continued writing, often under a pseudonym, an example being Draiper Letters (1724) under the name M.B. Draiper. Swift also published his masterpiece, Gulliver’s Travels under the pen name Lemuel Gulliver in 1726. An immediate best-seller, the book has inspired many theater and film adaptations. The novel represents the culmination of Swift’s years spent in politics with Whigs and Tories and also deals with socio-political issues hidden between the lines.